I’ll have to confess our house has been smelling like Easter a lot lately (but more about that later). If asked this same question when I was younger I would have said rosemary (not the distinct perfume of a distant elderly relative, but the fragrant herb!). I guess you want to know why rosemary, don’t you? When we were kids (under 10 years old) we, my sister and I, would usually go to our grandparents house in a small seaside town called Point Lonsdale for Easter Sunday lunch. Our Aunt and Uncle, and two cousins would usually be there too. We loved going, but the trip was made especially sweeter at Easter due to the annual chocolate egg hunt. Our Grandparents Gideon and Judy (Gran and Grandpa to us) would buy the hallow, egg sized chocolate eggs (and lots of them) and hide them all around their beautifully manicured garden. (Yes, I am getting to the rosemary bit)… Around their house was a neatly trimmed hedge of rosemary which seemed to be the hiding place of choice for these eggs. In our mad rush to collect the most eggs we would be diving our hands, arms and heads into this rosemary hedge to secure those Easter eggs. Resulting in a very vivid memory of Easter being associated with the smell of rosemary. On a side note (perhaps you could even call this a confession)…my sister and I were particularly good at the Easter egg hunt. Completely motivated by greed, but nonetheless we always triumphed. However, every year we had to face the inevitable. Regardless of how many eggs we collected in that hunt we were directed by Gideon our grandfather to combine all the eggs and divide them evenly with our two cousins. I hated that part, and felt it grossly unfair that we did all the work, and then had to hand over ‘our’ eggs to our cousins. The strange thing about that… we went back every year with the same drive and enthusiasm to find the most eggs, knowing what the outcome would be. Perhaps our motivation wasn’t greed after all, simply the thrill of taking part in an Easter egg hunt? 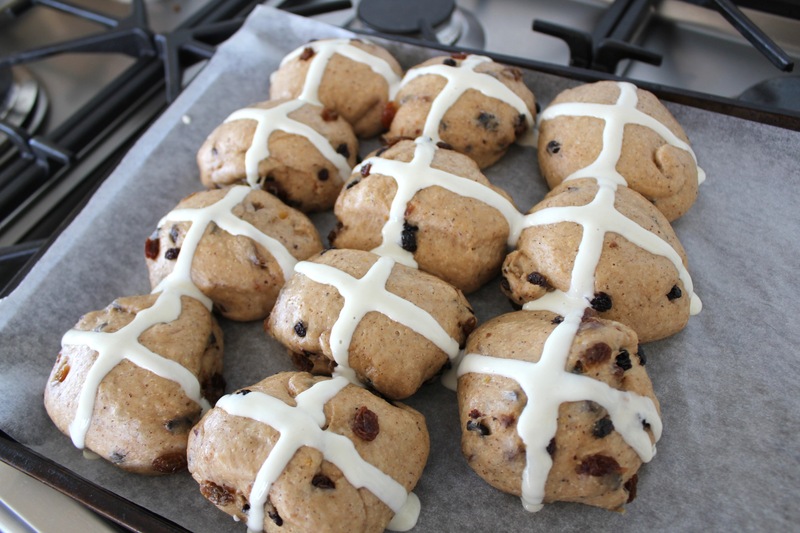 Let’s move on from my childhood egg hunt issues, cause I would like to share with you the recipe responsible for the hot cross bun smell in our house. I’ve made these twice now, and they worked both times. Based on that alone, I am branding this a good recipe. But when you also add that they taste great, and are really easy to make – you’re onto a winner! 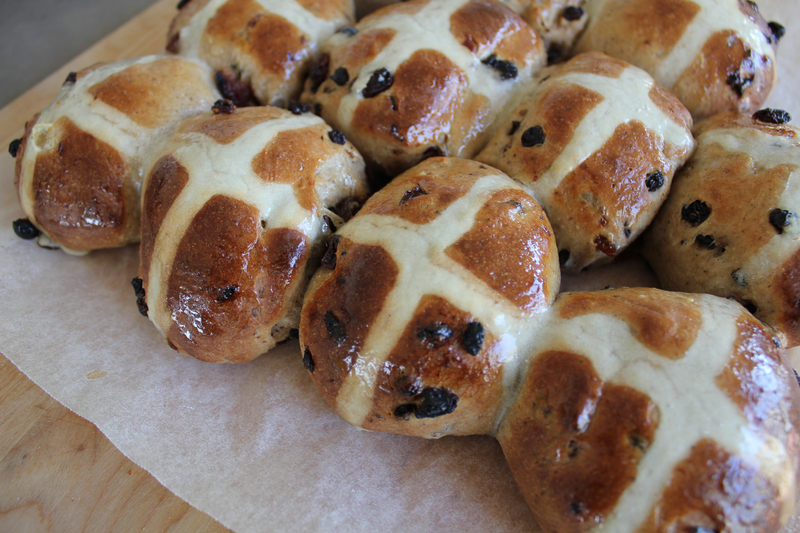 I made these in the Thermomix, but I have included a non TM recipe option too. Finely chop the mixed peel. TM: Place the mixed peel into the TM bowl and chop for 10 seconds on speed 10, then set aside. Place all remaining ingredients in the bowl with the milk and mix together. Turn mixture out onto a clean bench and knead for 10-15 minutes. 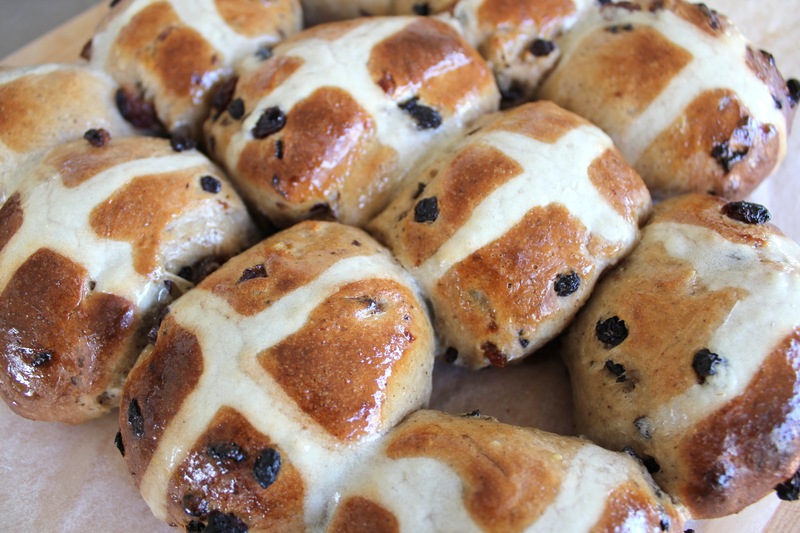 The hot cross bun dough is very sticky, especially at the start. To aid the kneading process, sieving a thin layer of additional plain flour onto the bench and over the top of the dough. Having slightly wet hands also helps. You can feel if the dough is ready. It’s not sticking anymore and it springs back and is smooth. All the sultanas are sticking out and you have to poke them back in. Place in a greased bowl, cover and leave to prove in a warm place for 60-90 mins, or until double in size. Pipe with crosses and bake in oven for 15-20mins or until golden. Brush with hot sugar syrup while warm. Place ingredients in small bowl and stir until sugar is dissolved. 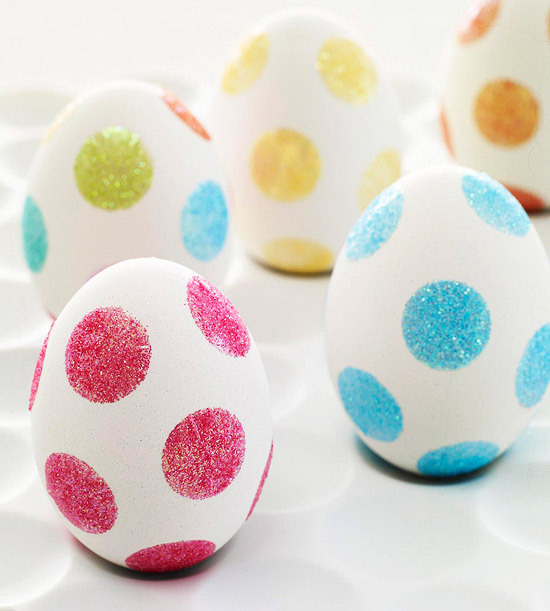 Another great resource is the 60 egg activities for kids from Tinkerlab for some creative Easter egg inspiration. 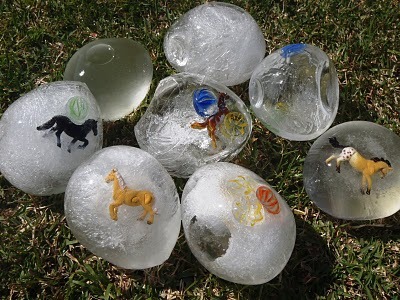 My favourite of their long list of links being the ice eggs from A little learning for Two… with the warm weather we have been having lately these would be ideal for Easter. Easter can be great fun, with so many activities centered around the occasion, especially in the weeks leading up to Easter. 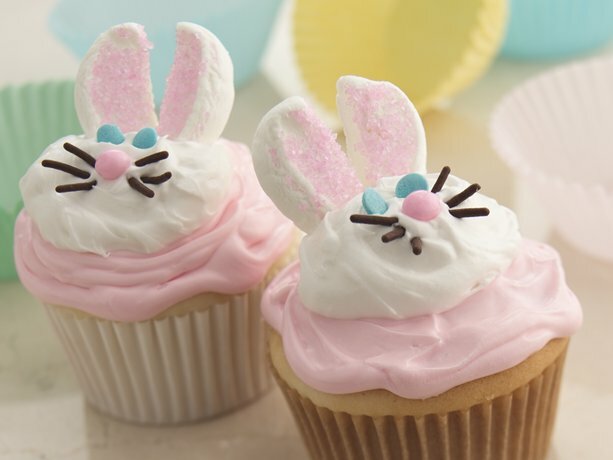 So get into the spirit and bake or create something for Easter this year. This post is dedicated to ginger nuts. When I say that I mean people who love ginger! I never thought I would be able to stomach ginger again after consuming packets of crystallised ginger during the first 3 months of pregnancy (to settle the morning sickness). Six months down the track and I saw this recipe for ginger nut biscuits, and had an overwhelming urge to make them (along with so many other exotic recipes – the maternal nesting has really kicked it!). This recipe was in the woman’s Day magazine, however I changed it slightly to make them a little more gingery (after tasting the raw mixture I didn’t think they deserved to be called ginger nuts – so got a little heavy handed with the ground ginger!). I shared these with 3 people on the weekend, and all of them wanted the recipe – so I guess you could say they were a hit. here have been several requests come my way for a good banana bread recipe. Whilst I have tried a few recipes, I wouldn’t have called them ‘good’, and certainly wouldn’t recommend them. So I responded to the requests with ‘leave it with me’, which left me with the potentially difficult and time-consuming task of finding a good recipe. This can prove tricky unless I start every conversation with ‘Hey, do you have a good banana bread recipe?’.